It’s a powerful word that evokes images of restless souls chained to bottles, pills and demons that vie for life itself. Yet there is a silent addiction that although just as toxic, often goes unnoticed in a society preoccupied with their next meal. 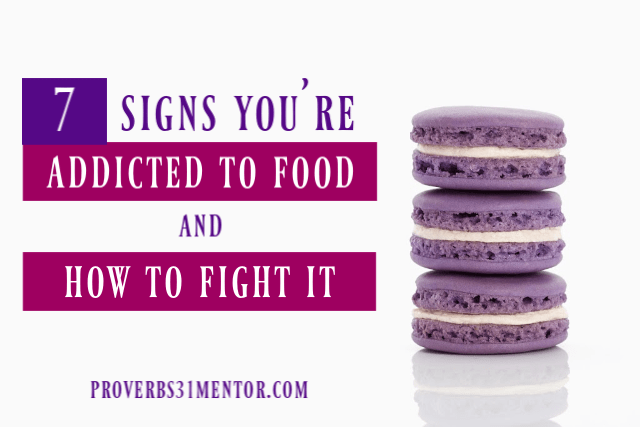 For many, being addicted to food is a real and powerful struggle. Surrounded by super-sized servings and the temptation to over indulge at social gatherings focused on food, for many, being addicted to food haunts their days and has them bound in chains. I’m one of those addicts. Having battled weight for all of my adult life, my struggle to maintain a healthy body runs deeper than a typical enjoyment of food. It’s a heart issue and a spiritual battle; one where I take my eyes off of the Lord and make food my god instead. fantasize about food or their next meal. They secretly obsess about food and planning what will be eaten that day. turn to food for comfort, instead of crying out to God in moments of pain. unknowingly create a false idol and place a higher importance on food than what should be. gorge themselves even when they’re not hungry. feel trapped in their way of life and are left frustrated by their obsession with food. fill a void in their life by eating. 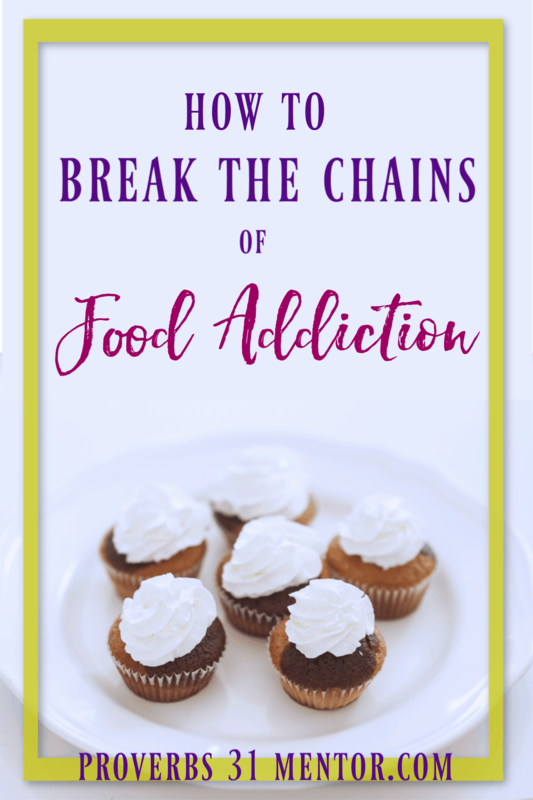 While the addict will physically reap the affects, this disease will wreck havoc on relationships and leave a path of destruction once food becomes an idol. A marriage suffers with the loss of libido or hiding a a body hidden in shame because of extra weight. A spiritual life suffers when an obsession with food outweighs a hunger for God’s Word. For those who bears this burden, it can seem as though there’s no way out. One may feel trapped by the cycle of binging and self-loathing, yet feel powerless to stop. Even in the darkness of being addicted to food, God shines His hope and offers a chance to start again. Just as with any obstacle, the first step is admitting you have a problem. Acknowledge your dependency on food to fill a void and suppress the longing in your soul and call it what it is- sin. 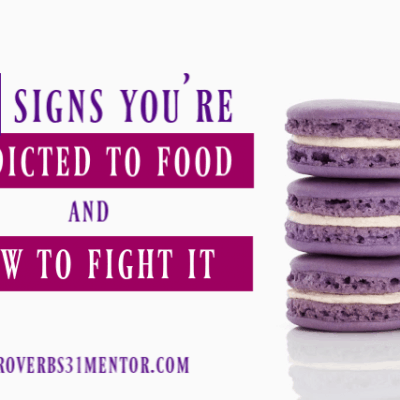 As hard as it may be to hear, being addicted to food is a sin. It blinds from the truth that God is our hope in this world and ONLY HE can fill your deepest craving. Repent of your obsession with food and lay this struggle at the feet of Jesus. Ask for His forgiveness and He will be faithful to lavish grace upon your transgressions. Aren’t if you have a relationship with Him. 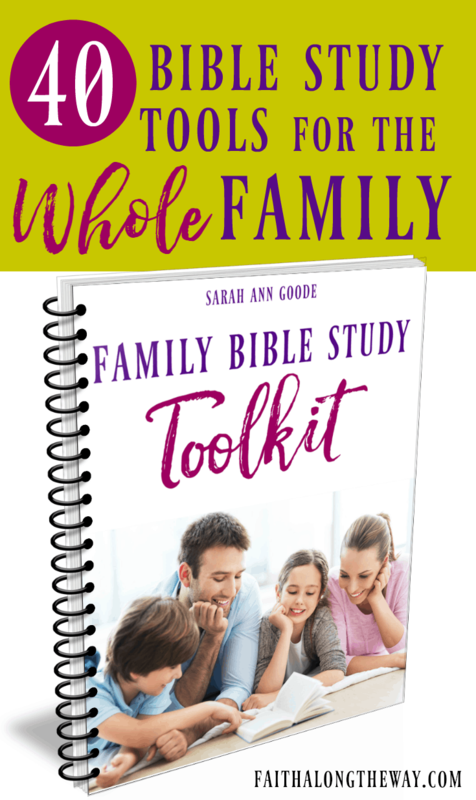 There are SO many fabulous, Christian resources available for your recovery and to help you break the chains of food addiction. 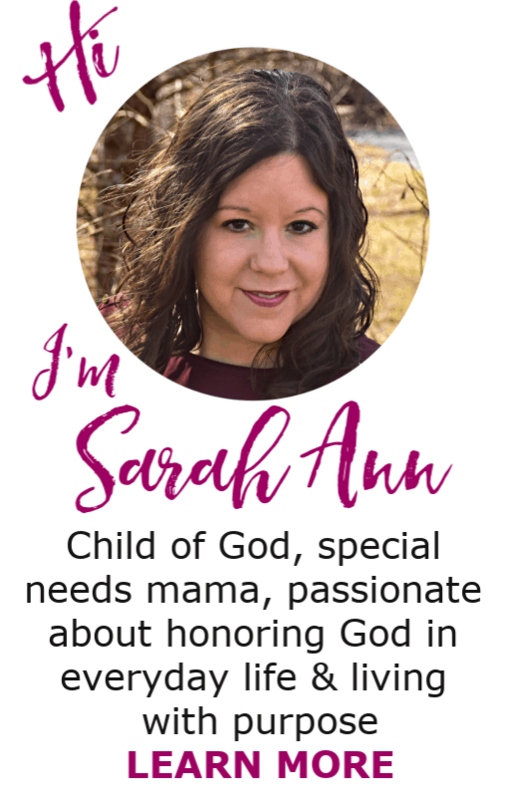 At the top of my list is Faithful Finish Lines, a Christian weight loss community that offers Bible based wellness and nutrition guidelines to help you break the chains of being addicted to food for good. They help you get to the root of your addiction, and take small, intentional steps towards change. 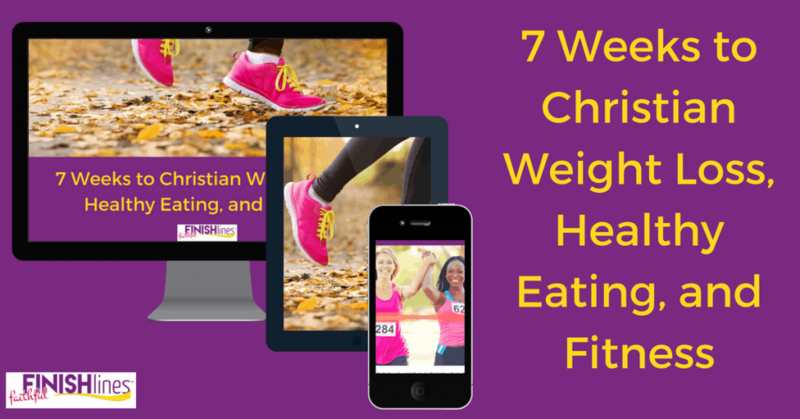 This program is run by two Christian women, Becky and Sara, who each have lost 100 lbs. and kept it off. They know what it’s like to battle food addiction and offer practical solutions to combat those ties for good! Besides weight loss coaching and nutrition counseling, they now offer at-home workouts to help you break you get moving, even as a beginner. Their fitness program, Faithful Fitness, is a Christ-centered workout program for both fitness enthusiasts and those who haven’t intentionally move their bodies in years. Really, they make every aspect of wellness easy and simple for beginners who are afraid to take the first step. 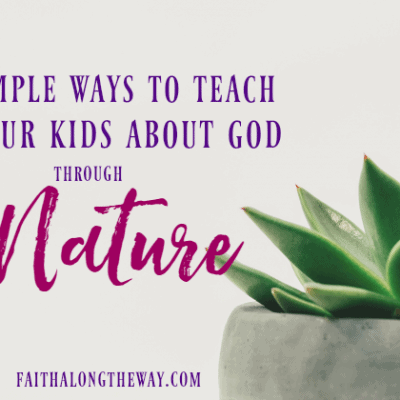 Most importantly, the coaches encourage readers to focus not only on getting physically fit, but on being spiritually fit as well. No one can break the bonds of addiction alone! Tell your friends and family about your desire to break the chains of food obsession for good. You need a team to celebrate each victory with you and to encourage you when you stumble. Choose TODAY to start your journey to a healthy and addiction free life. You don’t have to wait until a certain day of the week (seriously, you can start a health journey even on Friday! You don’t have to wait until Monday!) or a certain event in your life. Vow TODAY to start your journey to the healthiest you possible. Small but intentional steps towards a healthier you really add up, too! I started adding in small, healthy changes and lost 5lbs without much effort. Using the One Small Change Cards by my friends at Faithful Finish Lines, I tweaked my eating and movement just ever so slightly and saw maximum results. 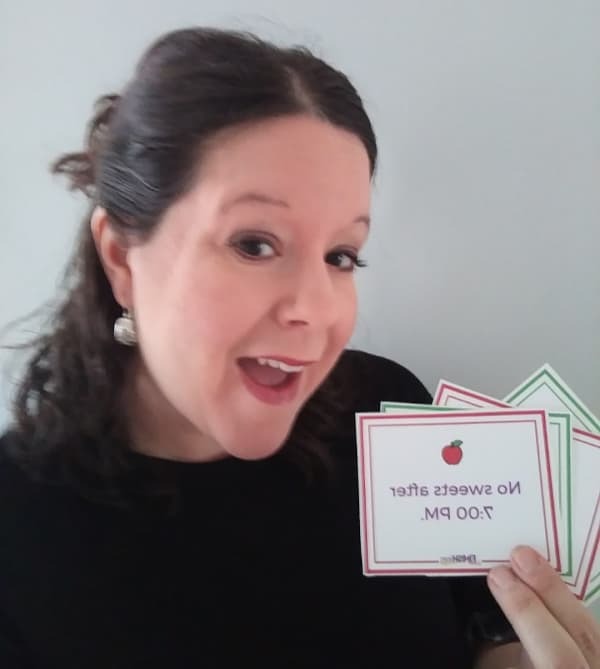 Here’s me celebrating my 5lb weight loss with my trusty One Healthy Change Cards! Pray, pray, pray! God WILL give you the strength to say no to temptation and the self-control to walk away from food. Continuously seek His guidance and confidently stand in the promise that He won’t let you be tempted beyond what you can handle. You ALWAYS have a way to say no to food! Friend, today is the first day of the rest of your life! 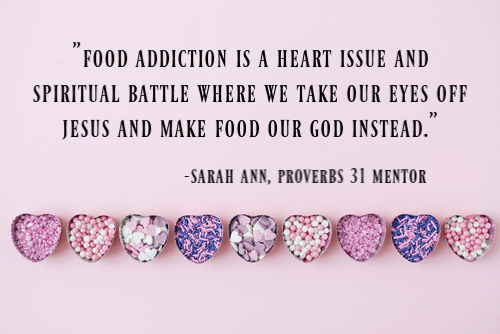 Let’s get healthy together and with God’s help, let’s break the cycle of food addiction for good! me too. I am battling again and again. I find myself on the losing side of the battle the last year and have gained a ton of weight compounded by some sneaky depression. 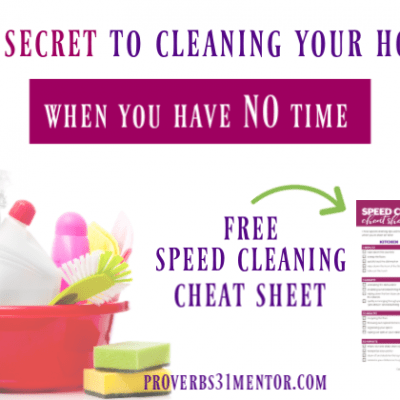 These are some great tips for those of use who struggle in this area. I am the same way! It’s easy to fall into the trap of eating for comfort and stress without ever addressing the root of the issue. May we all learn to find comfort in the Lord and not in food! And you don’t have to be overweight either. I don’t have a very healthy relationship with good after 8pm lol and I’m not overweight. Great point, Brittany! It truly is about our attitude and turning to food instead of turning to the Lord for comfort and satisfaction. Plus, are there even calories after 8:00 pm? Ha! I understand! You can do it, Angela! Don’t be afraid to start small and make small changes in snacks and food. I find when I feel better after small changes, I will want to make more changes. Trying to quit everything at once can set yourself up for failure. Best wishes!